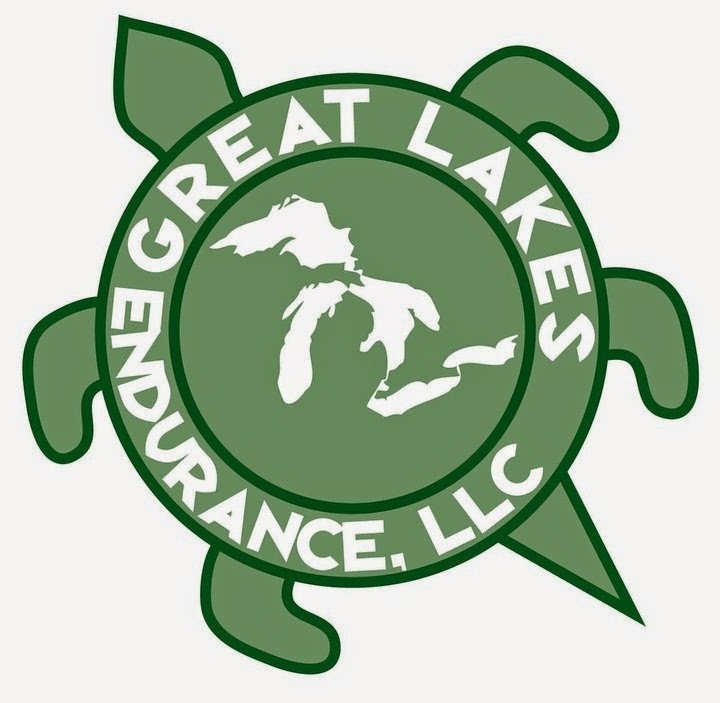 DETROIT RUNNER....: Donuts for 20 miles...yes please! 20 miles on the schedule today.....done! 20 miles with 20 days left until the marathon! I had an early start to the day. I started at 6am this morning and drove to Rochester to run on the Paint Creek Trail. Even though I had my headlamp, it was really dark there so I decided to run in Downtown Rochester until it got a little bit lighter out. I pulled up to the duck pond and there must have been several hundred ducks just sitting in the pond sleeping. It freaked me out! I did about 3.5 miles around town and then headed off to the trails. I love the trails since they are so nice on your legs. Of course, no matter what you're running on, when you are doing 20 miles, it's much harder at the end. I was also able to see several families of deer on the trail. It's great because you feel like your up north. I ran almost 11 miles when I met up with my running buddy, T. He's got his second marathon next weekend in Milwaukee with his brother. He said he's not as well trained but we'll see. He's a great runner. We ran all on the Paint Creek Trail. It did not seem like there was as many people out as in weeks past. People probably getting ready for their marathons. Since Chicago is in two weeks, most people running that are in their taper now. My running buddy is usually one to help keep me going and while I kept going, I was much slower by about 14 miles. For me, even though I've done 20 miles three other times, it just felt hard today. 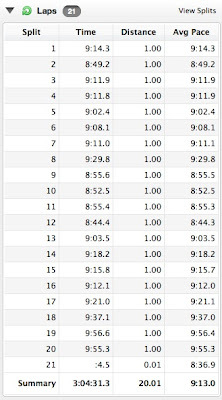 I mean, how can I see such a great job on the half marathon last weekend and then feel so crummy on this run. The half still remains my favorite distance! 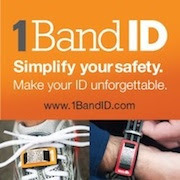 Fortunately, my IT Band did not act up so it looks like I'll be getting rid of another pair of shoes. I actually have about 380 miles on them and 400 is my maximum so I guess that's not too bad. After my running buddy was done with his 8, I still needed to do 1.5 more miles so I ran again in downtown Rochester. As you can see, the last two miles I really struggled. I'm not even going to over analyze the miles too much since, as you know, I'm trying to get under that 4 hour mark in the marathon. 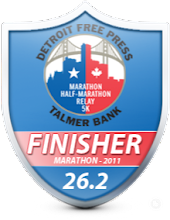 I'll have the pacer to help keep me going so I will depend less on my Garmin at the race. I usually get super charged at races and hope to be at this one as well. After the run, I really felt like a donut. Really? If you know me, I'm not one to eat donuts but I had the urge so I stopped at the local donut shop in Rochester, Knapps Donuts. In our house, we have to take pictures of these things as we don't see them too much. I had an Apple Fritter and also a half a pumpkin - yummy. And I'm not going to feel guilty about it - I more than worked for this treat! Question of the day? Do you treat yourself after a long run? great 20 miles. It was a good morning for it! I really want some of those donuts now. 20 miles! YES! Your time was great! Donuts! I am getting a donut for my next super long run because I can smell the local bakery for like 6 miles of my run. YUM! Anything pumpkin right now is calling my name! Omg I want those donuts RIGHT.NOW! I gave up sweets until the marathon. It's been a week and a half now and I haven't caved yet. It was REALLY tough after yesterday's 20 miler and then all of the donuts at the 5k I ran this morning. I run up on wildlife all the time ... usually deer or turkey, but occasionally I'll come a little too close to a skunk. Glad your IT band was good. Donuts are MY WEAKNESS ... and pizza. I could live on both! Thanks for bringing them to my attention ... now I'm gonna have to have one, or six tomorrow for breakfast. Great job on the 20 miler! It's interesting to hear your point of view, since you've done them before... I feel like I'm taking the lead from your training :) Can you believe we're only 3 weeks away! Nice long run! 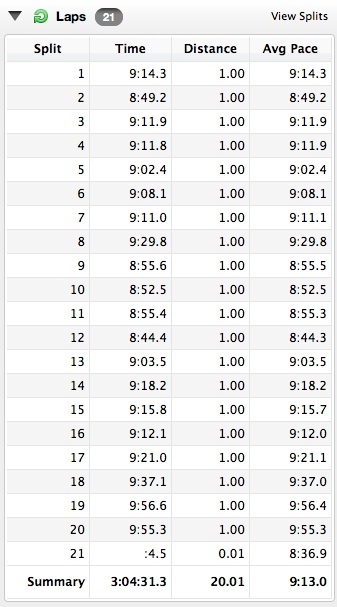 You slowed down a bit those last two miles, but you were pretty darn consistent throughout! Jim will be dreaming about donuts all night now. He can't resist them. Me, it's something I like on rare occasions. nothing better than getting back to the car after 3 hours on the mountain and cracking open an ice cold one!!! nice job in getting another 20 under the belt, I've still got a long way to go if I want to run a marathon in November. You deserve a donut or 2 after your 20 miler. Great Job! !